One Month In, Trying, Horrible, or Hopeful? Whoosh, bat an eye and gone is January. Oh but where did January go? Part of my New Year’s Resolve is to spend consciously, I must also reflect consciously about how the spending is going. Like a nice little circle to keep the budget in check, think about where the money is going and then reflect at month’s end if the energy was put in the right place. Budget, yes I said it. I am sure many laugh at me, as I am new to this budgeting thing. Heck the concept is not new to me, countless times I’ve wanted to keep a budget, but typically it falls by the wayside. Sort of like all the half empty pretty journals that fill a shoe box in my guest bedroom closet. It’s very loose as far as budgets go, no spreadsheets, just a yellow legal pad, a few categories, and some hope. Hope to do better, to reduce debt and get our spending in check. Two weeks ago, I walked into the Education building at the University of Colorado @ Boulder, for my first class of the semester. The building is eerily familiar to me, for I spent most of my days there, a decade ago. Not only was I a full time student, but also a work study in the School of Education. I opened the door to my classroom, to be greeted by a familiar face, my professor. Not only is she my professor for the semester, but she was also my advisor and professor my last go around. This professor brings a very unique passion to teaching teachers. She embraced me with a warm hug and I momentarily felt validated in my decision to pursue my Master's Degree. Of course, as with the School of Education, the room was full of classmates that I spent last semester with, with only one new face in the crowd. So they to, offering smiles as I walked in helped reassure me that I am doing the right thing. Well, in case you didn't catch my disdain for all that's happening with peanut butter products, please check out this post I wrote yesterday. There were some requests for a Granola Bar recipe. Guess what, it just so turns out that I have one. This granola bar recipe is from when I was in Jr. High school and had to take Home Economics. Seriously. I've held onto because the bars are delicious. Now, the recipe is going to be my new found favorite because I can't stand the thought of my girls eating mass produced products with cheap ingredients. I can control what goes into them! I may play with the recipe a bit and substitute in Almond butter or add dried fruit. Corporate Effects of Peanut Butter Recall, General Mills Owns The World! When I watch the 10pm evening news, I'm not paying full attention. Honestly my iPhone is usually in one hand and I am listening to the news, multi-tasking folding laundry, paying bills. I overhear mention of a Peanut Butter recall linked with salmonella. Eew. Then they say it's just affecting 5 pound tubs of peanut butter. My mind is prematurely eased, as in the next few days a wealth of information begins to unfold. I start to learn more and more about the products I consume. Then I feel disappointed in what I come to learn about the companies I choose to support. Oh yesterday, oh glorious day. I realized this morning that if I didn't write a reflection of yesterday's events I probably would regret it in the future. So here I sit thinking about yesterday. The girls and I spent the morning glued to the television coverage. I was thrilled that I could watch with my oldest, as Kindergarten didn't start until the afternoon, so the morning was ours. The history in the making was ours to share. I decided to take photos of the girls celebrating because I knew they would want to remember the day. To share with friends and their own children the day Obama was sworn into office. The day American History was changed forever. Mom, have their been any lady presidents? No, not yet. But what about that Clinton Lady, wasn't she President? No, she lost the nomination to Barack Obama, who is now our new President, isn't it wonderful? Yes, it is. I am so excited because now I can be the FIRST Lady President. Yes, you can. Followed up with hugs and big smiles. In that moment today I truly believed if she really wanted to, she can do it. Last night I purchased a rotisserie chicken, but decided to switch things up a bit. We normally just cut up the chicken and eat it as is. I did some searching online and decided to make Lighter Chicken Enchiladas, from Martha Stewart's Everyday Food magazine. I basically had all the needed ingredients and Mexican sounded great. 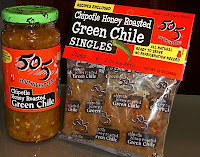 I had to switch up the recipe a bit because I did not have a can of chipotles in my pantry. Although, funny enough I tried to buy them, but Whole Foods was out of them last week. Maybe I knew enchiladas were in my future. Considering I was already switching up the recipe, I decided to make it kid friendly as well. *Add two tablespoons TOMATO PASTE instead of the canned chipotles. For many years, possibly close to a decade I didn't eat meat. I wasn't a selective memory vegetarian, I was a strict vegetarian. Those selective memory vegetarians are the ones that occasionally indulge in meat even though most of the time they tow the line with living meat free. In that case, my response is why label yourself, just eat meat when you want to. 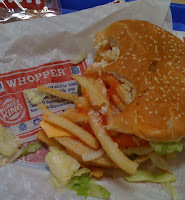 Don't make the point of saying your vegetarian when you once a month consume a burger!. Memories take me back to eating out at restaurants and being so neurotic about my vegetarian ways. I would ask the wait staff if there was chicken stock in the vegetable soup or if my vege burger was going to be grilled right along with the bacon and beef. Most of the time, grilled cheese and fries, or a salad were my go-to's for eating out. Restaurants these days seem to be much more in tune with dietary restrictions, I think living a vegetarian lifestyle is much different now. My Hand Is Extended, Will You Shake It? If you've been around here before, maybe you'd just move in for a hug and brush off the hand shake. As you may know I like an embrace or sometimes more, but no kissing today I promise. 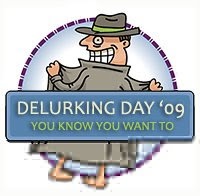 So what is Delurking day? Today is the day, your big chance to say hello. I'm friendly, I love comments, and if you have never commented before raise your hand and say something loud and clear. Over in that little comment box. If you regularly comment, join in the fun. If you have something more than hello to say, well then please go right ahead and do that as well. I am hear to listen. Thrilled by the prospect of what you may say because today is the day. Delurking Day was started by Rude Cactus and that lovely little Delurker Logo, created by none other than the fabulous Greeblemonkey! Having a little privacy isn't too much to ask or is it? I need your advice, turns out my spur of the moment explanation is driving me bonkers. Check out my embarrassing dilemma over at Rocky Mountain Moms Blog! Please leave some words of wisdom, I can desperately use them! While My Husband Was Hanging With Celebrities, I Was Ankle Deep In Water! Seeing my artificial Christmas tree in it's bright red storage bag flashed back a few memories for me. Memories of a year ago, New Year's Day. My husband opened our crawl space doors to find a few inches of standing water coming from our old water heater. Now many of us say, "hot water heater", but that's redundant for the phrase heater is indicative of making the water hot. So after much research I am firm in my water heater terminology being sure to drop the hot off the beginning. Time For A New Year, New Groove! As for many of you, this morning is the first morning of the rest of the year. The morning the kids are back to school, hubby is off to work, and the groove that was once flowing in the household may return. When was that groove by the way, maybe mid-November? It had to have been before all the excitement of big meals, arrivals of men in red suits with loads of toys, baking cookies like we were a retail establishment, and chocolate fondue for New Year's Eve. But it's time to get back to business around here. I am so ready. Funny enough my daughter's school district didn't think two weeks was a long enough break for the holidays. My kindergartener had the Friday before and Monday after break off as well. For a total of way too many days off. I don't even know if she can recognize her ABC's anymore or count to 10. Wonder how long it's going to take nineteen 5 and 6 year olds to get back into the business of learning groove? Even though I am not huge on "New Year's Resolutions", I will happily admit I am huge on the New Year. I love the notion of starting anew. New year, another chance to seize the moment. A great way to work through personal struggles, with a fresh beginning. With a New Year, comes some general notions on how I would like to steer the course for the next year. A chance to really take living to the next level (for me! ).